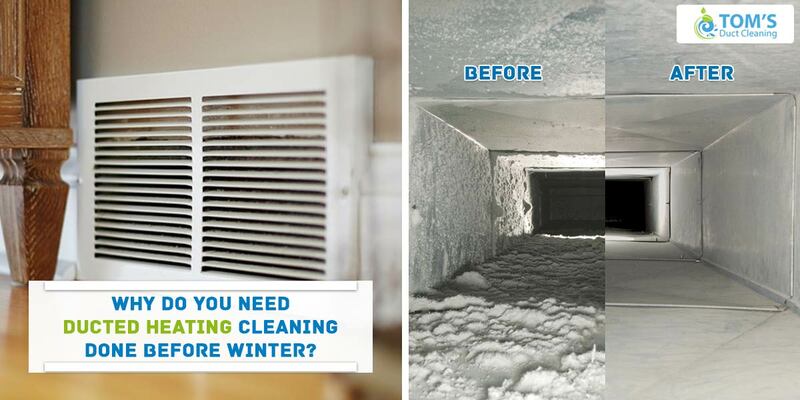 Why Do You Need Ducted Heating Cleaning Done Before Winter? Winter is just around the corner and we at Toms Duct Cleaning Melbourne, Cleaning Air and Ducted Heating Cleaning Services would strongly advise you get ducted gas heating up and running. We recommend our customers and generally to the people to get their HVAC system cleaned especially before winter, for the following reasons. It is only logical to get your ducted heating systems checked right before it gets freezing outside. Since you’ve been going to stay huddled up in your interiors when you’re not supposed to be elsewhere you’d want your rooms to be well insulated. And for that, you need heat ducts to be well functioning. Heat ducts are positioned just above the skirting and sometimes right at the ground level. Have you ever wondered why is it’s position opposite then that of the air vents? Heating Vents are positioned lower because (high school science) and also that warmer air is thinner and it tends to move upwards. Since these ducts are positioned down below one can only imagine the amount of grime, dust food crumbs, dirt, tiny things dropped in by your pets and babies would have gotten collected inside them. This could lead to blockage of proper heat circulation and may also cause health problems. If your house goes unattended for a day, you’d find dust percolated in carpets, curtains and glass furniture. Not just dust but dirt, pollen, ash, hair, allergens, fungus and mould. What about your HVAC system? Ducts, air conditioners, ventilators, furnaces, etc. are most prone to percolation of debris because of their functionalities. Since you wouldn’t be turning on your heating ducts during the clear bright Australian sunny months, you might need to get ducted heating cleaning done by a professional to make sure your air is healthy and breathable. NADCA (National Air Duct Cleaners Association) and EPA (Environmental Protection Agency) Michael Vinick, NADCA President recommends homeowners to clean their HVAC system every once every three to five years. “If you have any allergies or asthma, you should consider having it done almost annually,” he quotes. EPA recommends ducts to be cleaned when there is a sincere blockage. Regular air vent cleaning and ducted heating cleaning can save you from health complications and therefore its treatment. It also increases the life and effectivity of your HVAC system, letting you call repair services less. Winters can cause colds, viral infections, cough and fever because it generally takes a toll on people’s immunity system and this is not just anecdotal. It is now proven by researchers scientifically that it is true. Now when you switch on your ill-maintained heating duct, infested with fungus, moulds, dust and other allergens when the weather is already weakening your health, you just are bringing home more trouble. This could be more troublesome if you have infants home. Carbon Monoxide poisoning has become a menace now and it is more prevalent than we reckon. The main catalyst to CO poisoning is lack of good air circulation and ill-maintained gas appliances. I’ll maintained air ducts can cause such gases to get trapped indoors. Some Air duct cleaning studies have shown that on average an American’s interior air can often be from two to five times more polluted than external air. When ducted heating systems, vents, and furnaces get contaminated with fungus, mold, construction debris, bacteria or insulation fibers, air quality inside becomes compromised. That leads to a higher risk of breathing problems as well as other probable fatal circumstances. We are a NADCA referred Air Duct Cleaning Service providers call our experts on 1300 068 194 to get on-site, same day visit and get your heat ducts in the finest state and also to get the finest state of mind and comfort in the winters.